The Guardian Trident Dog Light incorporates a durable base allowing for secure attachment to collars, straps, webbing, molle, belts or a variety of other applications. The unique slot opening can accomodate up to 1.5" in one orientation and 1" in the opposite direction. 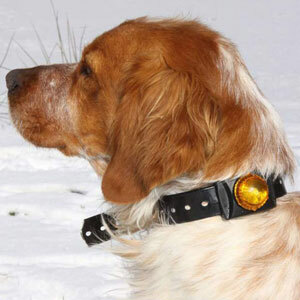 Ideal for Pet collars, life-jackets, backpacks, etc... and is compatible with all 1" tracking collars as well as the Tracker Flash hunting lights! It also works as a safety beacon that allows you to be seen from over a mile away. The Guardian base and lens are extremely high impact resistant and the ultra bright LED. The Guardian is waterproof to a depth of 328 feet (100 meters) and will work flawlessly in conditions from -0F to 140F (-20C to 65C). This light is extremely versatile and a variety of handy options are available that can be used to attach The Guardian to almost anything.